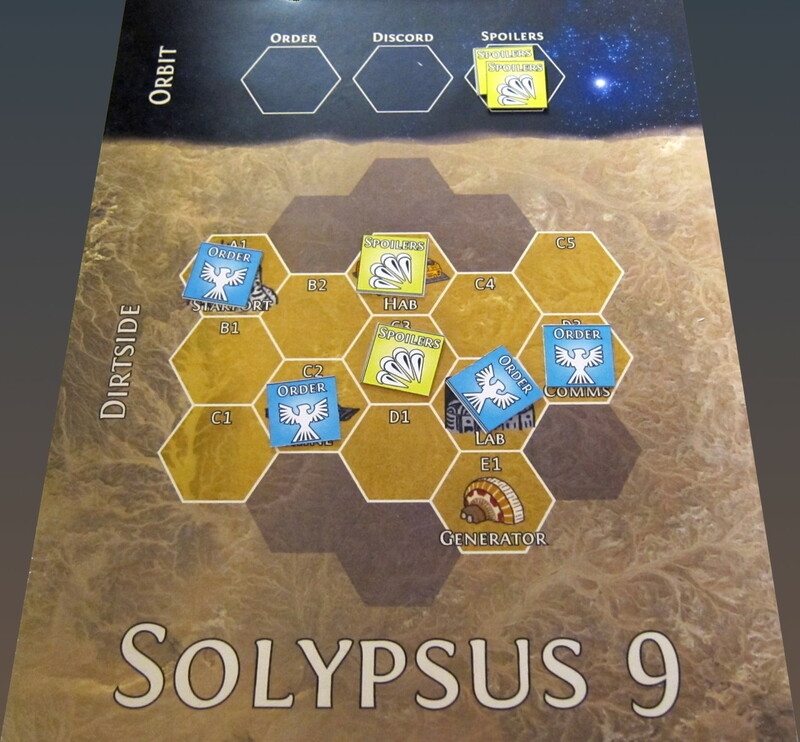 Our Solypsus 9 campaign kicked off yesterday. 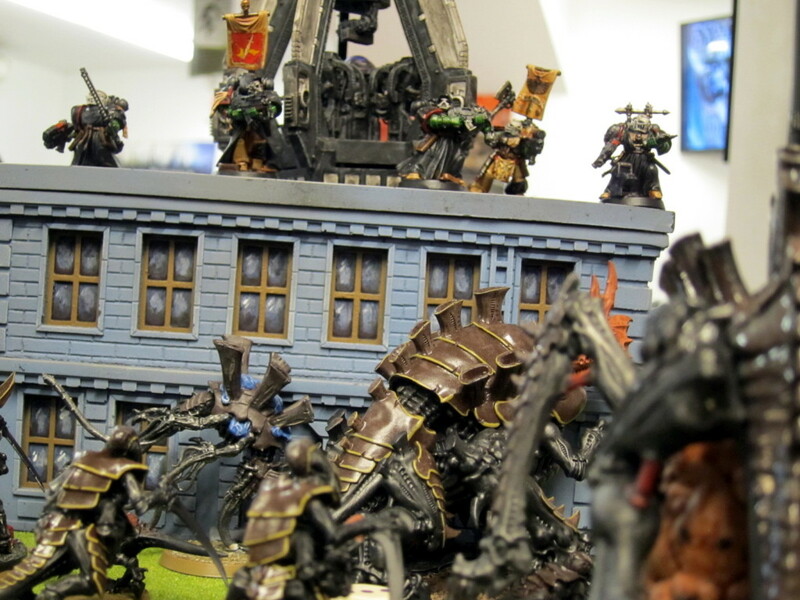 A massive horde of Tyranid including some Orkoid biomorphs descended on the planet, with Space Marines and Imperial Guard arriving just in time to aid the colony. More photos are in the day’s Flickr gallery. 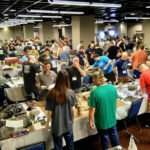 Results and missions are on the event webpage. 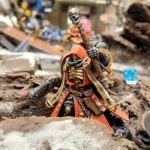 Core campaign mechanics are in the Solypsus 9 draft. Kingbreakers rush headfirst into the oncoming wave of Hive Tyrants. The campaign mechanics seemed to work out really well in their debut. 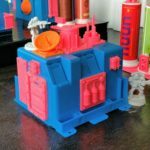 There are a lot of details, especially to accommodate varying group size and composition. The basic idea though is that each alliance has a set of armies abstractly representing the major thrusts and conflicts of the campaign. Both teams secretly simultaneously place commands on those armies to Attack, Support, or Defend. They then alternate picking one of their Attacks and nominating an attacking player and target territory, with the opposing side(s) responding with a defending player. Results and control of the targeted territories are based on victory points earned there that round. Support and Defend commands aid in those contests, respectively contributing +5 to all adjacent territories and +10 to the territory itself assuming they aren’t wiped out or blocked. The missions themselves followed the basic pattern we’ve been using: Each is worth up to 20 victory points, with 9 points available for a given primary objective based on markers or kill points, 6 points for a secondary objective chosen by each player from a list with options such as assassinating characters or controlling terrain pieces, and up to 5 points for several tertiary objectives such as claiming first blood or tagging superheavy vehicles. Battle commands going into round 3. Action in the first stretch of the campaign was concentrated around the Laboratory and the open ground at the center of the colony. Round 1: The Swords of Dorn dropped successfully on the Laboratory, beating out the Ork Mob harrying them. 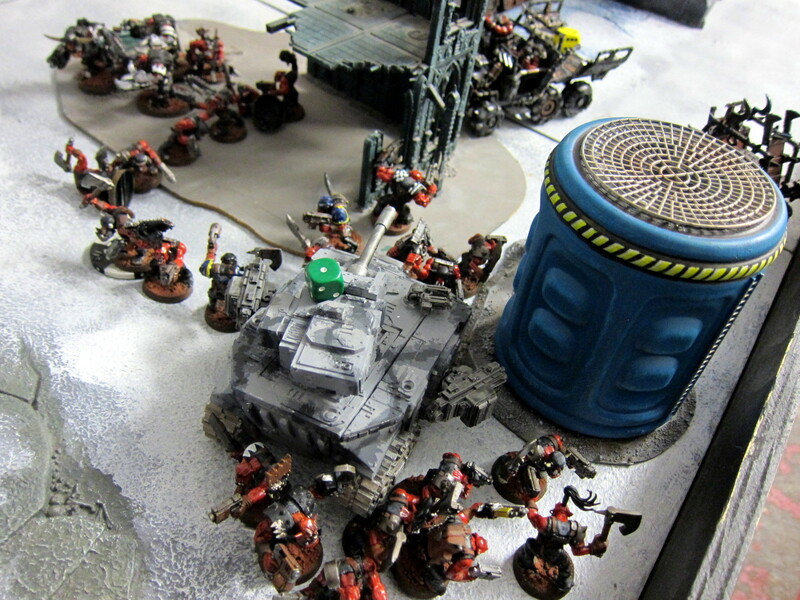 Blood Angels repulsed the Endless Swarm’s attack on the Generator. Both forces met on the colony’s central ground en masse with the Kingbreakers barely countering an advance by the Living Artillery but the Spore Cloud overwhelming the Armoured Company to take the territory. Round 2: The Armoured Company was kept on the retreat by the Ork Mob, losing the Hab Blocks to the invaders. 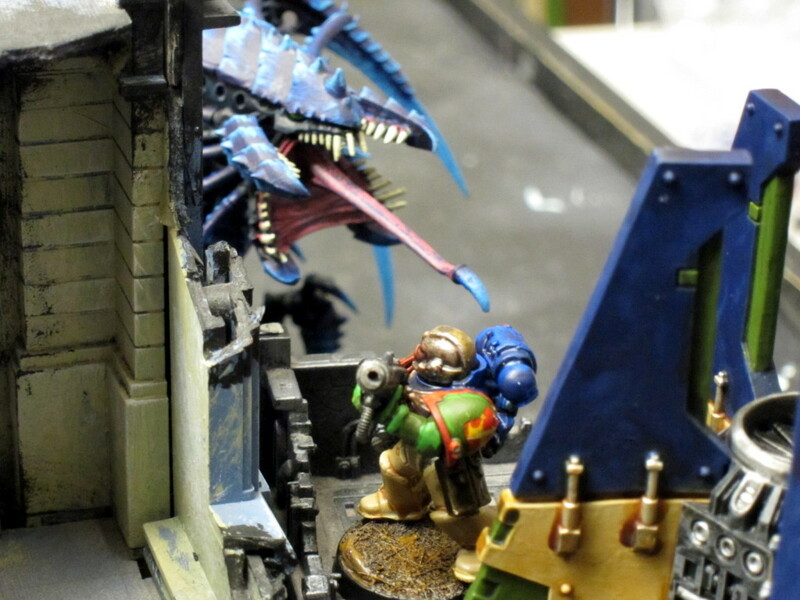 A counter-attack by the Living Artillery on the Laboratory was blocked by the Blood Angels. Kingbreakers tried to disrupt the swarm’s plans at the colony’s center but could not dislodge the Spore Cloud. At the Comms Tower the Swords of Dorn boltered away the Endless Swarm. Round 3: Swords of Dorn and Blood Angels both assaulted the Mine, with the Legion of the Damned tipping the odds against the Spore Cloud and Ork Mob. 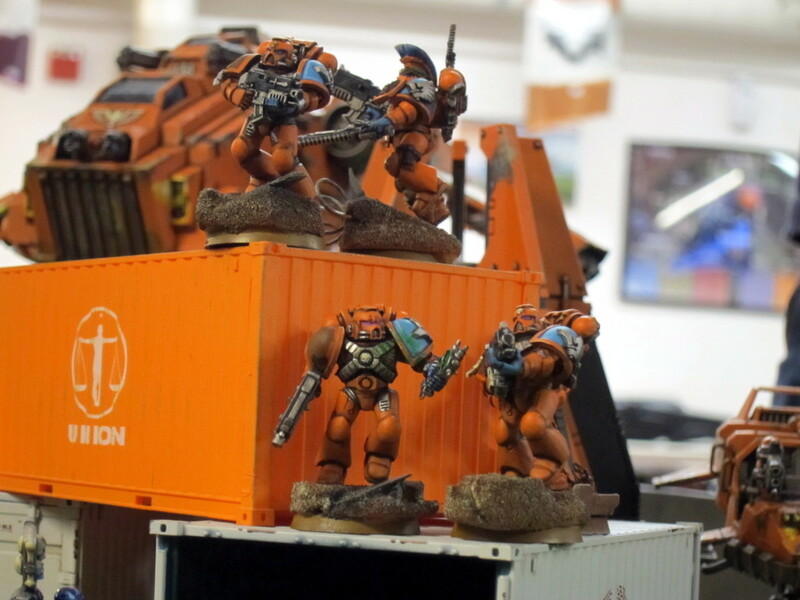 The Swords of Dorn make landing on Solypsus 9. 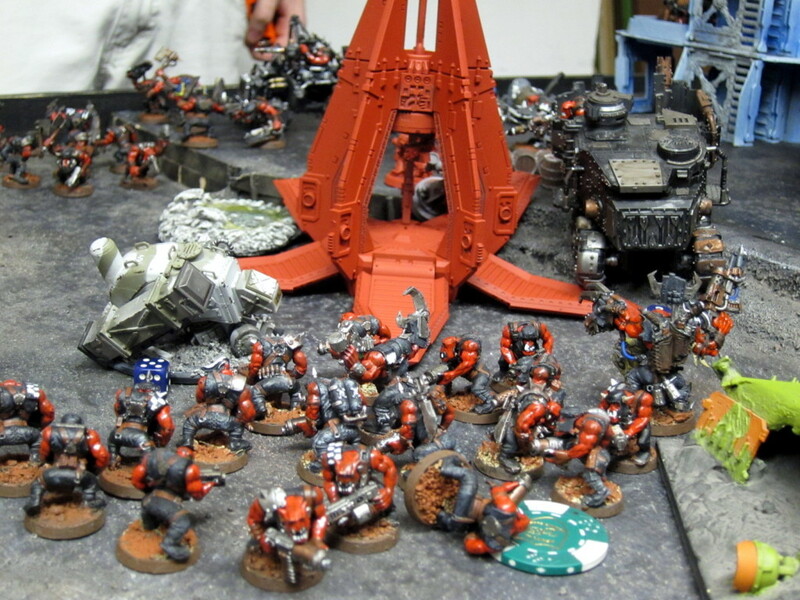 The Ork Mob surrounds the Blood Angels’ landing site. While the Armoured Company as well is mobbed by the Orks. But the Swords of Dorn stand strong throughout. 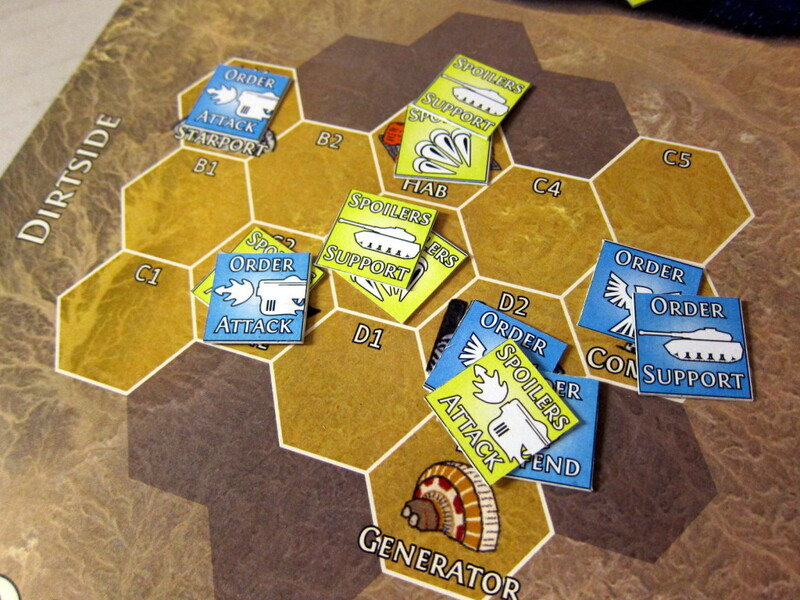 The Forces of Order squeaked out a tactical win, with 123 victory points to the Spoilers’ 110. They also claimed a lead in campaign points for controlling installations at the end of the session, 5 to 1. Most of the colony was successfully reinforced by the Imperium, with Order armies establishing positions at the Laboratory, Mine, Starport, and Communication Tower. The Spoilers though clawed their way into the Hab Blocks and gouged out a safe beachhead at a central position among the settlement’s installations. Alex won the standings for Order and overall with three straight wins and 91 points. Patrick took the Spoilers’ lead with 70 points. 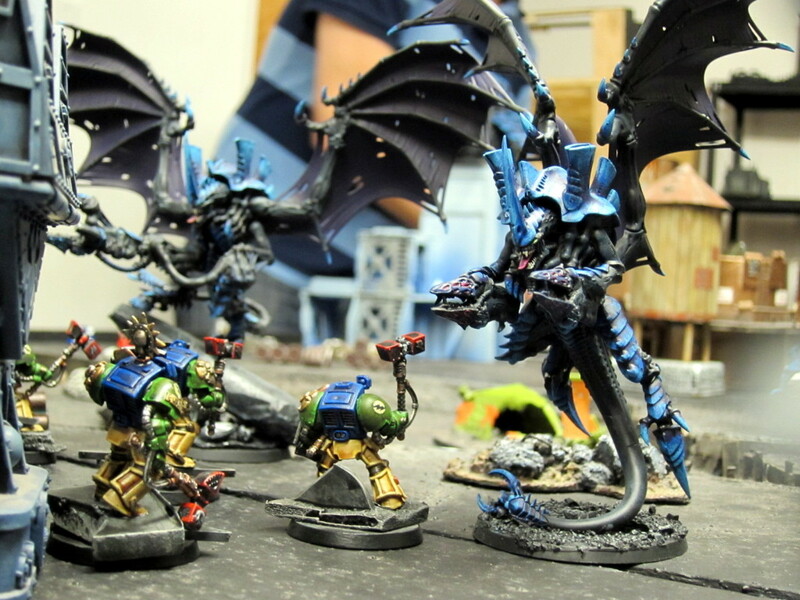 Best Painted was also voted for Alex for his gorgeous Swords of Dorn and Legion of the Damned, with Michael P’s Tyranid big bugs in second then bumping up to take the prize. Michael also continued Jason’s tradition of his shirt matching his army, something we should all aspire to. Status after the end of the first campaign session. We had an odd number of players otherwise, so I wound up joining in the action. The Emperor’s greatest soldiers had a so-so day. 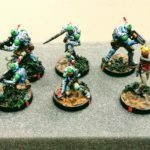 As is typical, my all-around list didn’t have a clear best opponent so it was repeatedly put forward as an attacker for the defenders to react against with their preferred army. In the first two rounds the Kingbreakers fought Justin and Michael’s big bugs. Unfortunately both had a strong force of wing-equipped Hive Tyrants. Typically I try to muddle through ignoring flyers and flying monstrous creatures. That’s been working out ok against Daemons and Imperial armies because the former have to land to assault and the latter typically don’t do enough damage. These flyrant flotillas though were well equipped to rip up my army, particularly the Knight. I’d taken the latter despite our Victory Through Attrition tertiary objective making it a substantial handicap, yielding a victory point for each hull point lost. I knew that’d be a problem but it’s just a cool model, and I wanted to see how much of a disadvantage it’d be. Turns out it’s a big one! Either way though these FMCs would have been a problem. Unfortunately I did not bring my usual bunker, which would have been helpful here to safely squat on a home objective. In the final round two of the Spoilers had to leave so Lovell and I fought it out. This was an old school-feeling battle, much like facing 5th edition IG. His Armoured Company literally had no infantry models, and nothing but Leman Russ chassis except for a Sentinel and an Avenger flyer. This was probably the army I was best equipped to fight, due to lots of re-rolling melta. It was still an awful lot of tanks to go through though. 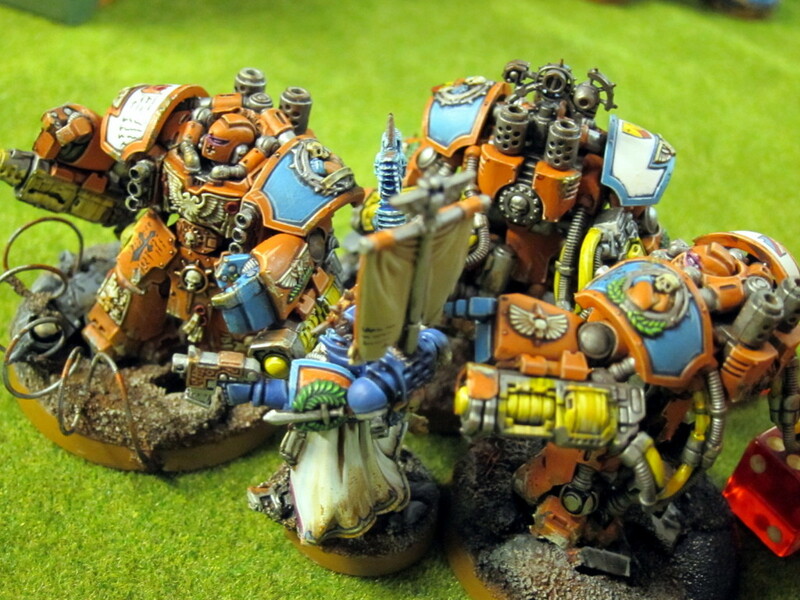 Kingbreakers eventually won out in the kill points mission, but a lot of the killing was done by just a few units. Much of Lovell’s army that could really threaten the Knight was targeted and wrecked early, giving the Knight fairly free rein. Captain Angholan also did far more than his share, ruining a number of opponents with his Vorpal Blade (S6). Meanwhile many Tacticals and others stood around literally hoping Lovell would forget about them with his battle cannons. 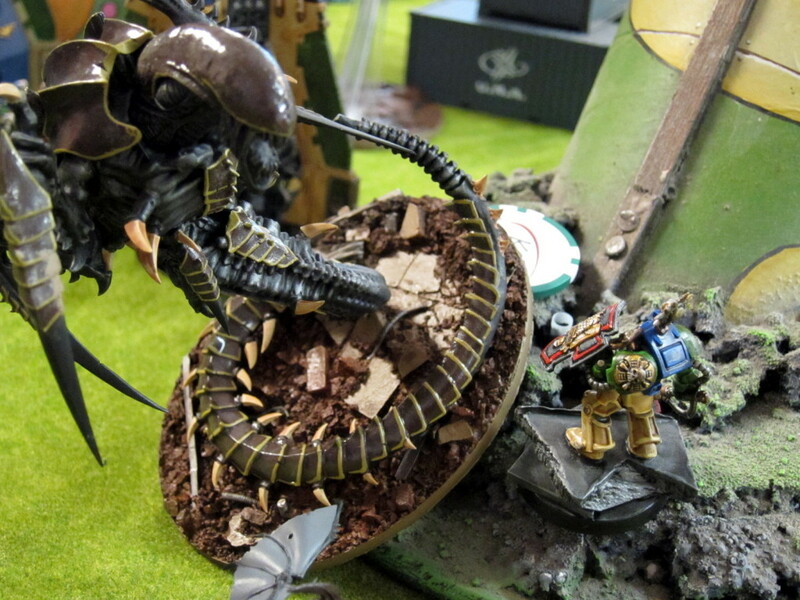 Kingbreakers scour the ruins for Tyranid monsters, finding them all too often. Kingbreakers Ghosts snipe away at the brain bugs from the rooftops. A pitched battle on a critical objective. This was definitely a busy day on my end, trying to play a fairly sizable army while also managing all the campaign and tournament logistics. It worked out to be another great day though. I was particularly pleased that the campaign mechanics seemed to work well, as they’re essentially an entire small boardgame unto themselves. The teams seemed to be making a number of real decisions about how to proceed on the map, and there was a definite evolution of the conflict across the board. I’m looking forward to how that progresses in the future, as well as other surprises to be thrown into the mix. Again, photos are up in the day’s Flickr gallery, results and missions on the event webpage, and campaign mechanics in the Solypsus 9 outline. See y’all in February! 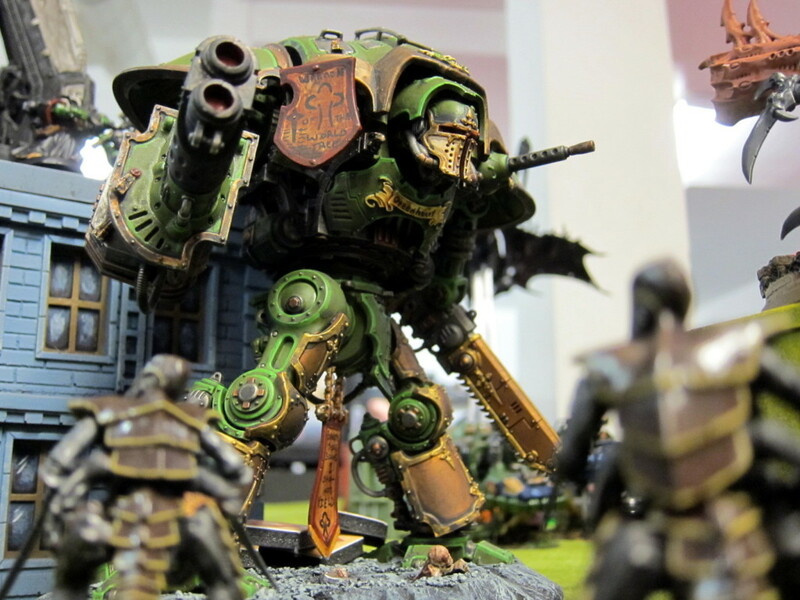 The Imperial Knight Greenheart walks among the horde.